Here is another installment of our Boss Lady Hair series featuring Master Stylist Hannah Anderson. Out of all the styles, this one is the most professional. It is classy, elegant, and best of all simple! Don't fret if you have short hair, all you need is enough hair to wrap towards the back of your head. So anything that falls below the chin is perfect for this messy chignon style. In fact, this style is easier if you have shorter hair because you don't have to worry about pinning up all that excess length! 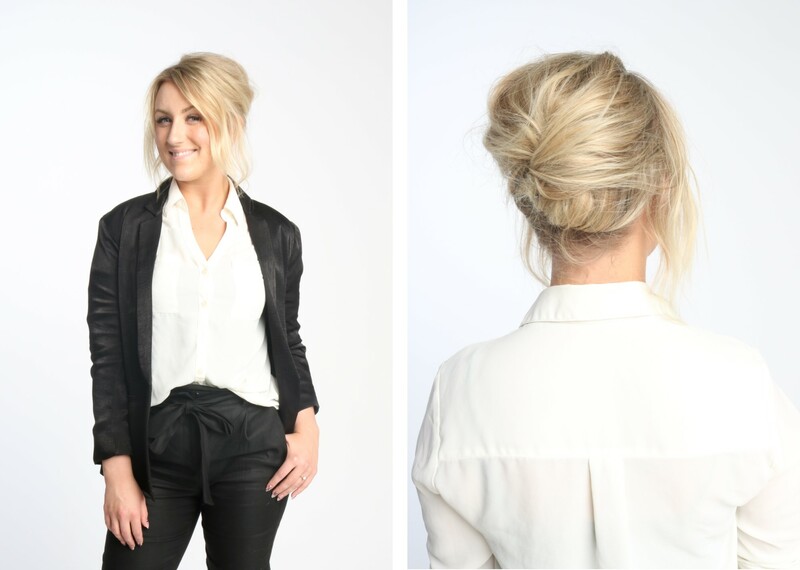 Without further ado, follow these steps to achieve this effortless office hairstyle. Start by parting your hair to the side. On the larger side, section the hair in two sections, bringing the upper section to the back of the head. Pin in place with bobby pins. On the other side of your part, section the hair lengthwise, and bring the back section around and combine with the lower section from the other side. Bring that underneath the other pinned hair and secure in place with bobby pins. Loosely bring the last section over the other 2 pinned areas and tuck the ends under before securing into place with bobby pins. Gently tug on the hair to soften the look and spritz some Air Control to hold the style in place all day. This style is perfect when you don't want to use heat or you just can't get that blowout to behave. Add a little bit of Shampure Dry Shampoo or Texture Tonic if your hair is naturally straight or extra slick. Make sure to check out the other styles in the Boss Lady Hair series here and here to get some inspiration to change up your 9 to 5 look!